The Memberships page allows you to manage all the available memberships or add new ones. 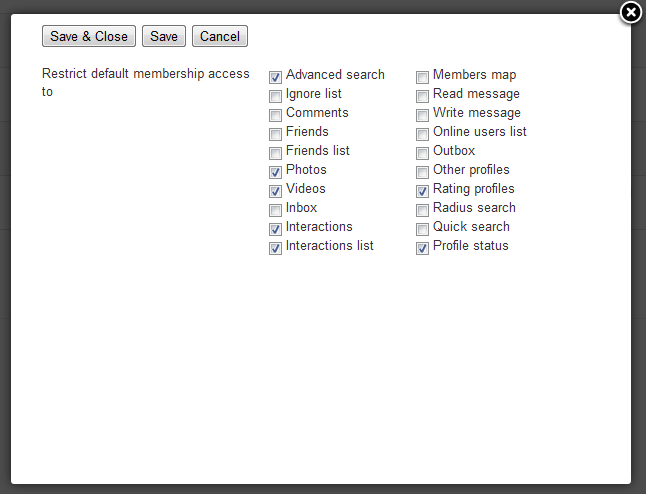 To reach this page go to Settings and click on Memberships. Depending on the user memberships, he or she can have different properties. This is what you can define in the Memberships section. What you can't define here is the period of availability of the memberships, this page allowing you to change their restrictions. 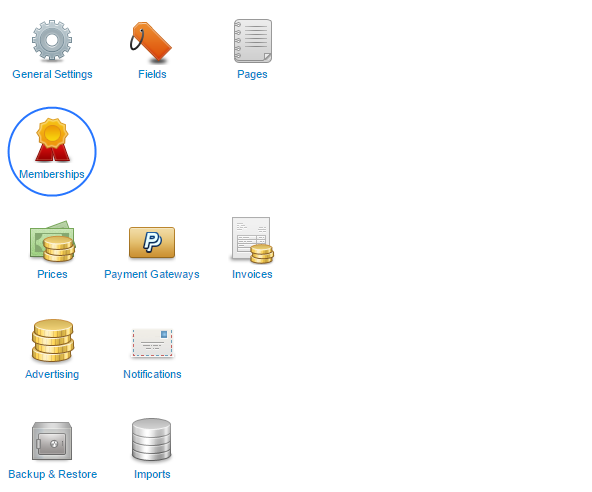 When signing up, users will automatically be assigned to a Default membership. You can modify which one is it from here. The default membership is available for an unlimited period of time for all users! 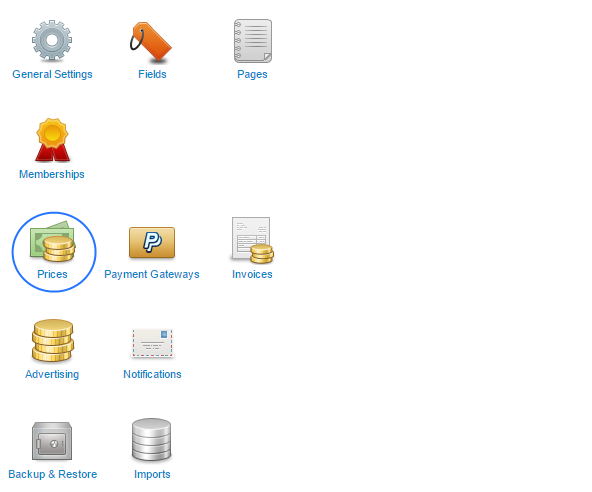 Note that after a membership expires, the user will get back to the one set as Default. Clicking on the Options button will display a pop-up window, from which you can restrict the default membership access to different areas of the website. By checking Update all sold memberships, it will apply these settings even for the users that already have the respective membership active. If you are experiencing issues with permissions, resave your memberships after enabling the Update all sold memberships option. Now that you have set the memberships, you must add their pricing so that users can buy membership plans. In order to do this, go to Settings and click on Prices. 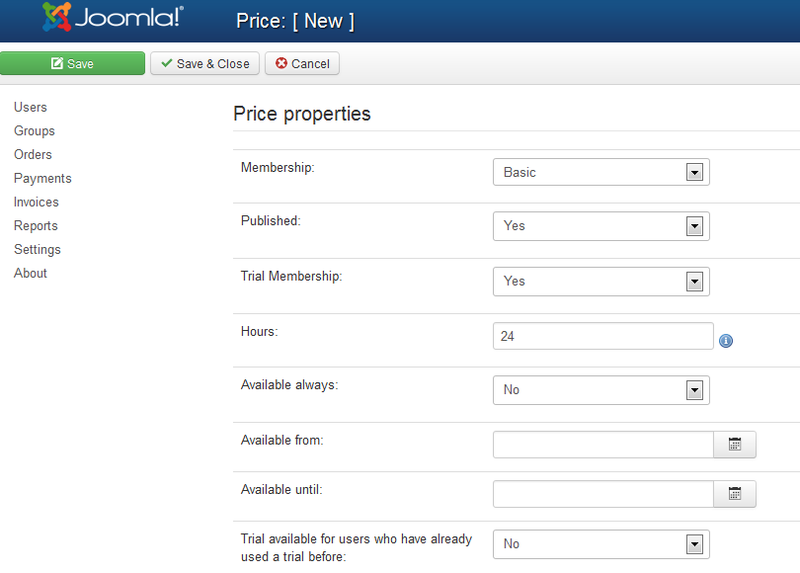 Clicking on New allows you to add price properties to the available memberships. 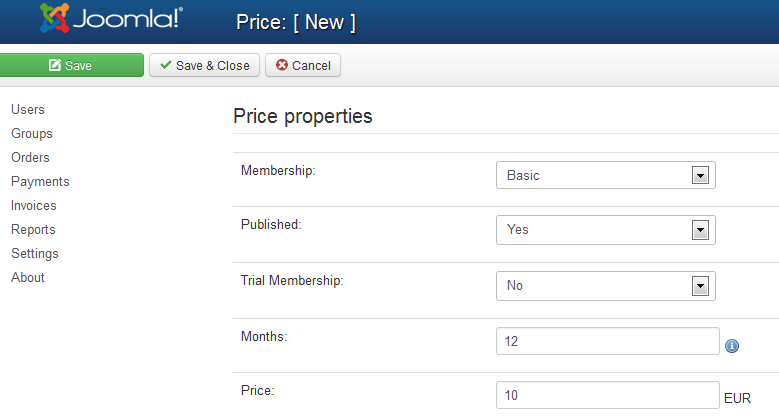 Select the membership you wish to add the price settings and then if you wish to publish that pricing plan. The Trial membership option allows you to add the new membership pricing as a trial. This is available so that you can let users test a membership, for free. After it expires, they revert back to their previous membership (if still active, otherwise the default is applied). For the Trial membership you can set the duration in hours, and also set if it's always available (toggling the "Available always" field) or be active only between a certain time interval ("Available from:" - "Available until:"). A duration of "0" will create a membership pricing plan with an unlimited duration. Click on "Save & Close" to save the price settings. Image displayed with Trial Membership set to "No". Image displayed with Trial Membership set to "Yes". Here is a generic Pricing page after adding some pricing plans. Clicking on the Options button will trigger a pop-up window from which you can change the used currency. 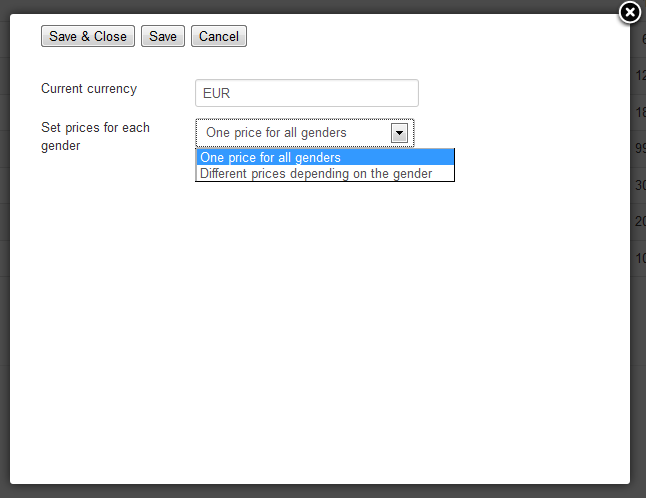 Set prices for each gender allows you to add different prices depending on the gender or one price for all genders. This will change the price properties section and add multiple fields for each gender. In case you enabled Set prices for each gender, additional fields will become available when creating/editing a pricing plan. 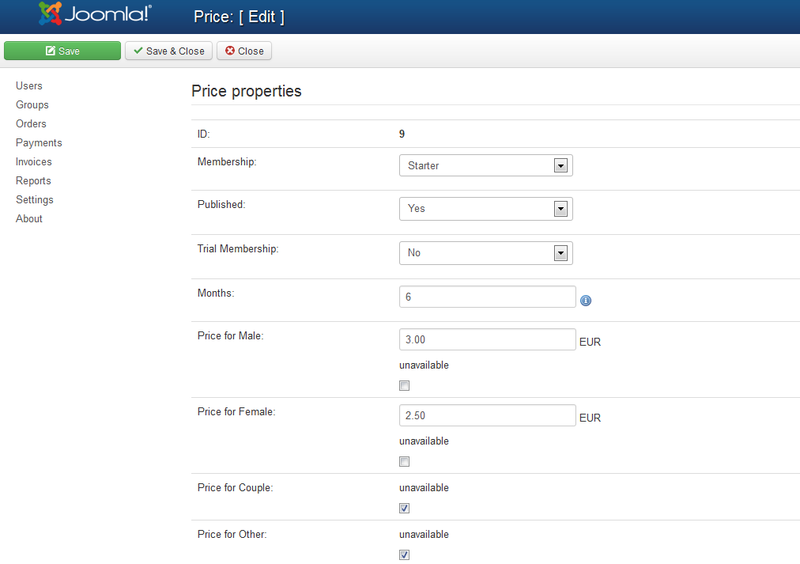 You will be able to add a different price for each gender or make it unavailable. 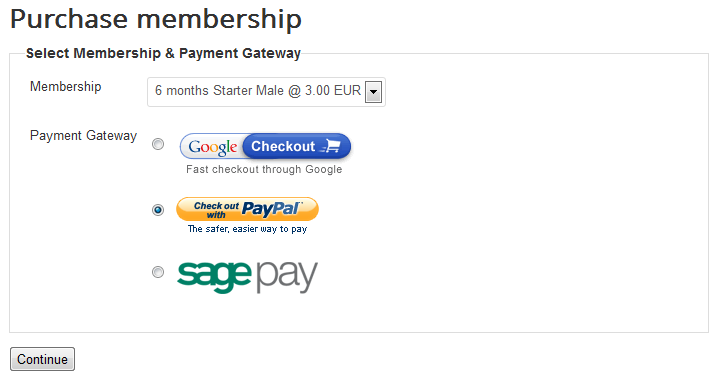 Here is how the membership page is displayed on the frontend once you add a pricing plan. Note the "Male" text below the price, meaning that the logged in user is a male and that the price is specific for his type of gender. Once clicking on the price will redirect the user to selecting the gateway and the period of availability of the selected membership.